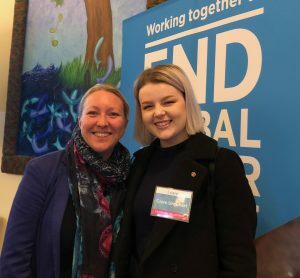 As part of my internship with PWRDF, I had the opportunity to participate in the Canadian Foodgrains Bank Hunger on the Hill event in Ottawa, to learn about global hunger and advocacy and to meet with Members of Parliament. 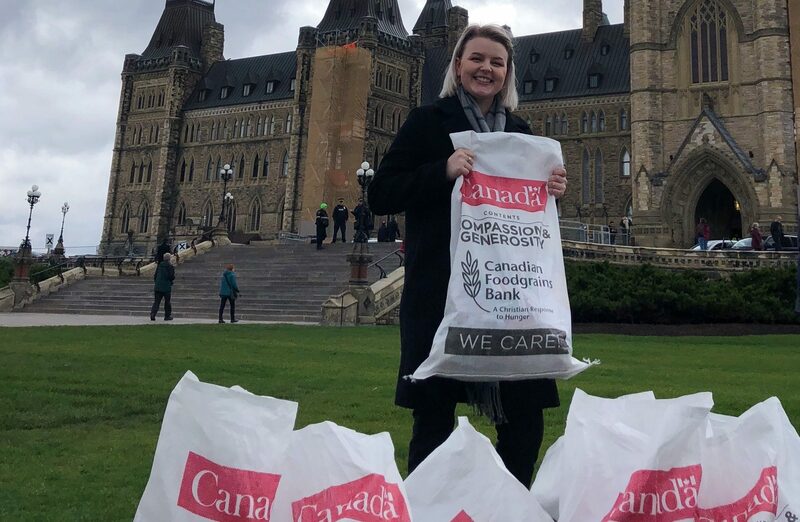 This event was part of the larger Foodgrains Bank I Care campaign – aiming to share the message to the Canadian government that Canadians care about ending global poverty and hunger. The I Care campaign is a movement run by PWRDF partner, the Canadian Foodgrains Bank. By writing our postcards to the Prime Minister, we hope to inform the government that Canadians care about international aid. Global hunger is on the rise and we are asking the Canadian government to step up and take action on such an important issue. Since Canada started contributing to a better world, extreme poverty has been cut in half and the rate of hungry people in the world has decreased by nearly 100 million. But we can still do more! Currently, only 1.7% of Canada’s budget goes toward international aid – around $5 billion. That may sound like a lot, but to put it into perspective: In 2014, Canadians spent $6.6 billion on their pets, we also spend $22 billion a year on alcohol alone! 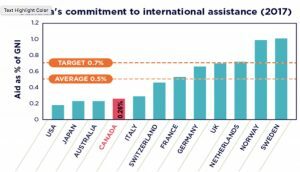 In 2017, Canada only contributed 0.26% of Canada’s Gross National Income (GNI) to international aid – significantly less than other countries (around 0.52%). Our contribution goal is 0.7% of GNI which was first proposed by our former Prime Minister Lester Pearson before being adopted by the United Nations in 1970 as a global target. Other major aid donors like the United Kingdom, Norway and Sweden have reached or surpassed the 0.7%. These countries have proven it is realistic to give this amount and have affirmed the importance of addressing global poverty. We began the day with a panel of MPs – Mona Fortier (Liberal) and John Barlow (Conservative) talking about the issue of Canadian aid from their perspective, tips on how to get members of Parliament involved and a Q&A session. Another panel followed with CanWaCH (PWRDF is a member) as well as other NGOs working in international development. The rest of the day was spent learning how to tell stories to engage with MPs and prepping for those we were meeting the next day. We went to our first meeting with a liberal Member of Parliament, Jati Sidhu from Mission, British Columbia. Sidhu was very welcoming of the campaign and was happy to sign one of our postcards and help get our message further! Our next meeting was with MP Earl Dreeshen from Red Deer, Alberta, with whom we talked about the importance of aid for agriculture. And lastly, we met with Karen Vecchio, MP from London, Ontario, where we discussed the importance of helping women in agriculture in places of poverty and signing our postcard. Following our meetings, we delivered more than 8,000 postcards to Minister of International Development, Marie-Claude Bibeau on the steps of Parliament! Before attending Hunger on the Hill, I knew almost nothing about what the Canadian government was is doing to support people around the world. Now I am very comfortable telling people in my community about the work of the I Care campaign, the Canadian Foodgrains Bank and PWRDF’s role in it. With plans to talk to churches around my diocese, I am starting to organize other events in my community to spread the importance of international aid and helping those in need. To find out more about the I Care campaign or about the work of the Canadian Foodgrains Bank please email icare@pwrdf.org or visit www.foodgrainsbank.ca.